General histories listed on the page for Books about Angus & Kincardineshire, in particular Warden, vol. 4, pp. 1-27. For the full range of maps of Kettins, see National Library's Maps. 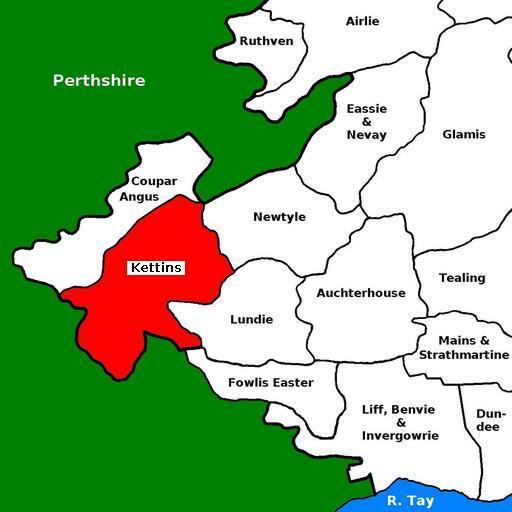 See Geograph.org: Kettins - recent photographs of Kettins. National Grid ref. NO2339. Located at National Grid ref. NO238390. Built 1768. The mediaeval kirk was dedicated to St Bride (Bridget). One may note the dedication of the Birgittine monastery of Maria Troon at Dendermonde in 1471 [Ulla Sander Olsen, "The late medieval chronicle of Marie van Oss, abbess of the Birgittine monastery Maria Troon in Dendermonde, 1466-1507" in Erik Kooper (ed. ), The Medieval Chronicle: Proceedings of the 1st International Conference on the Medieval Chronicle, Driebergen/Utrecht, 13-16 July 1996, pp. 240-50 (Amsterdam: Rodopi, 1999)]. There was also a priory of Maria Troon at Grobbendonk, east of Antwerpen, that was sacked in 1579 - Priorij Onze-Lieve-Vrouw-ten-Troon te Grobbendonk. The bell may have come from there, if one accepts that the name of the bell should match the name of the place it belonged to. David Paton 1650-1692 b. ca. 1624 Dundee; M.A. Kings Aberdeen 1644; adm. to Kemback FIF 11 Jul 1648; tr. & adm. 9 Aug 1650; d. Apr 1692; mar. Christian Brown; John; James, min. here; David; Christian; Agnes; Grissel; Margaret (mar. Alexr Bruce, merchant, Dundee); Eupham (mar. John Haliburton of the Fodderance); Geo. David Symers 1801-1842 b. 1 Jun 1778, son of Colin S., min. of Alyth; gson of above John Haliburton; ord. 7 May 1801; d. 16 Jul 1842 unmar. Andrew Jervise recorded some monuments at Kettins in his "Epitaphs & Inscriptions", vol. 2, pp. 90-100. * A further 73 people lived in the Perthshire part of the parish. Kettins was in the Commissariot of St Andrews.